This is my favorite recipe! I make it at least once a week- it’s also kid friendly. Sometimes I swap out the Italian powder dressing mix with ranch mix. I’ve linked some ingredients to Amazon- just for you to see the exact product I use, you can find them at most grocery stores! Drizzle olive oil on the bottom of the dish- enough that it coats the bottom. Sprinkle half the packet of Italian dressing mix and swirl into olive oil. Drop in cut potatoes, coat with olive oil mixture and place in oven, while it preheats. When oven has reached 400*, remove pan and and add chicken and green beans. Drizzle olive oil on top and the rest of the dressing mix. Using a brush, swirl everything around – making sure all items are coated with olive oil/dressing mix. For chicken tenders – bake for about 10 minutes, then take out of oven – flip chicken and swirl around olive oil mixture. For chicken breasts– bake for about 20 minutes, then take out of oven- flip chicken and swirl around olive oil mixture. Continue baking until chicken is cooked thoroughly. Typically that’s about 15 total minutes for chicken tenders and 25-30 for chicken breasts. Eat and enjoy this simply yet delicious meal! The chicken in this meal provides protein, the potatoes provide Vitamin C, Potassium, Vitamin B6 (and more! ), and the green beans provide Calcium, Magnesium, Copper and more! 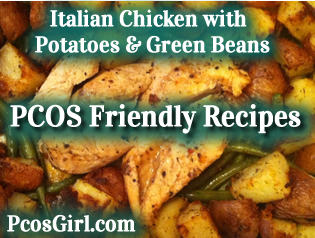 This entry was posted in PCOS Friendly Recipes and tagged chicken, healthy eating, recipe.